This new study powerfully asserts the pivotal importance of the interplay between language and ethnicity, which is often underestimated as a component for political stability. These leading scholars present five key case studies of South Africa, Algeria, Canada, Latvia and Senegal. All five countries are multilingual nations where language has been a central political issue that has challenged their unity and stability. These studies are underpinned by two general, comparative and theoretical discussions, which analyse how scholars consider social class and economic factors to be the primary sources for political cohesion or of malcontent with the system and the new avenues opened by a focus on issues of langauge. 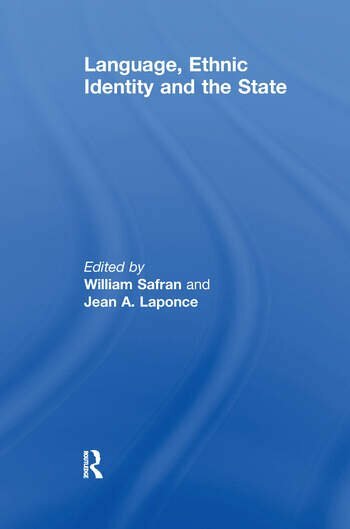 This book will be of great interest to all students and scholars of linguistics, language, politics and sociology. This is a special issue of the leading journal Nationalism and Ethnic Politics. William Safran is Professor Emeritus at the University of Colorado and Editor-in-chief of the journal Nationalism and Ethnic Politics. Jean A. Laponce is professor of political science at the University of British Columbia and director of the Institute of Interethnic Relations in Ottawa.